Prayog will feature three choreographies – “Matsyaangnaa” and “Trishanku” choreographed by Madhuri Upadhya and “Chakra” choreographed by Sathya BG. The performance is based on Indian philosophies and their relevance to the contemporary times. The duration of the performance is one hour fifteen minutes. In the proscenium of Indian dance space, Prayog (meaning “Experiment”) is a brand that seeks to establish itself in the performing arts world as a dance theatre production par excellence. In its last few avatars, Prayog has effectively used technology, classical dance, movement, martial arts, poetry and storytelling to create breath taking works of art. In its format of short, powerful pieces, Prayog gives the choreographers and the dancers a forum for experimentation, pushing the boundaries of their bodies as dancers and of the art as a discipline. Prayog-4 is a furthering on the creation of a unique, unconventional dance brand that would lead the Indian contemporary dance ethos into new directions. The choreographers interpret and understand the contextual importance of Prayog researching the 75 – minute production over a year. The dancers undergo training in Yoga, Bharatanatyam, Abhinaya, Rhythm and Body conditioning to match up the standards that a Prayog demands. The production usually is a melting pot of musicians, designers, dancers, visual artists, singers, and actors amounting to more than 50 accomplished artistes of India. Matsyaangnaa: The choreographer, Madhuri Upadhya, has chosen mystical mermaids to depict the indulgence of 6 classifications or enemies which prevent a human from attaining Moksha. The concept is from the Vedic philosophy of Arishadvarga’ the six emotions of desire and passion – kama (lust), krodha (anger), lobha (greed), moha (attachment), mada or ahankara (pride) and matsarya (jealousy) and her interpretation of life. Trishanku: Trishanku was stuck between heaven and hell and got a new world to inhabit albeit upside down due to the sins he committed. 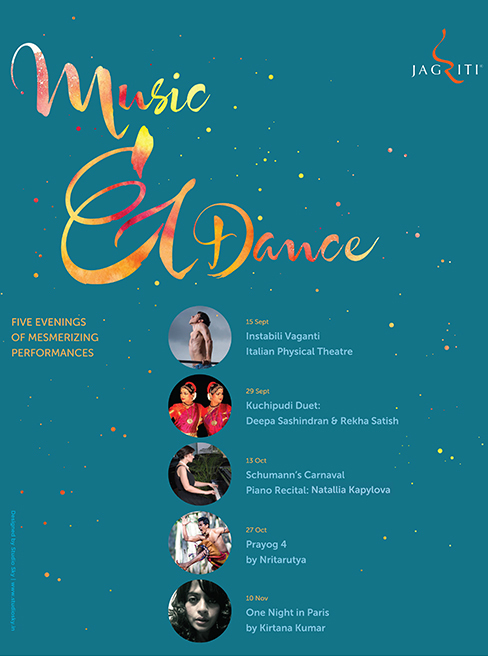 The piece, choreographed by Madhuri Upadhya, seeks to explore 2 different time zones through a classical section designed by Guru Kiran Subramanyam and the modern times through contemporary dance. The dancer is restricted to a circular space on stage with a restless energy. Chakra: Sathya B G works with belief system of “what goes around comes around”, making use of the ‘circle’ as a shape to interpret his movements. The concept of Karma ‘what you give is what you get’ comes within “Chakra”-circle. His visual for the piece is a never ending cycle of actions and its repercussions, explored through idioms of breath, life and movements. The combination of male and female energies, the black and the white, completing the circle of life is brought out using Bharatanatyam ‘Adavus’ in a unique way. The cyclic de and re construction of the Adavus makes for an interesting combination tracing the evolution of the dance forms. Led by artistic director Mayuri Upadhya, Nritarutya is a premier Indian Contemporary Dance Trust from Bangalore that draws inspiration heavily from various ancient Indian traditions and creates new works representing the contemporary times. The trust evolved out of a need and belief to showcase, impress upon and inculcate core cultural values and aesthetics in young India. Having completed over twelve glorious years, critics now acclaim them as ‘a dance company of exceptional choreographic vision, backed with well-trained and skilled dancers’. Since its inception in 2000, Nritarutya’s repertoire of performances has grown into a collection of the most creative dance inventions. Through its work Nritarutya, supports and initiates understanding of new Indian dance expressions arising from unique urban structures of living, physical traditions [martial, dance & movement] and performing practices. From ideas to movement, Nritarutya’s dance language is a blend of rich imagery, physical articulations and dynamism, all of which draw inspiration from the large repertoire of Indian aesthetic frameworks and sensibilities. Nritarutya provides training and travels with its Indian contemporary dance productions both nationally and internationally and is best known in the country as one with distinction for dance and allied arts of music, costumes and scenography. It is rated by the yearbook of Indian dance – Attendance – as among the top five (best) in India. Nritarutya has performed in 9 different countries, travelled to major International festivals and continues to aspire to imbibe from pan-Indian cultures.